Again and again and again (somehow the novelty never seems to wear off). Slowly drifting around the lazy river. Sliding glass doors open up to private oversized balconies with oceanfront and partial ocean views. Multiple indoor pools keep the kids happy no matter what the calendar says. Beachfront location with multiple indoor and outdoor pools. Grab a tube and join the kids on the lazy river. The resort has 2 indoor pools – one for adults and one for kids to keep everyone happy. The Tiki Bar may become a family favorite for snacks and drinks. Designed to include just about every pool scenario imaginable, the oceanfront Mar Vista Grande is a family-friendly escape with effortless access to the beach. But as close as the sand is, it may take you awhile to work your way down there, since you’ll get multiple requests to stop at every pool, hot tub, mushroom splash fountain and lazy river along the way. When it’s time for lunch, head toward the large outdoor deck off the fifth floor lobby – it’s perfect for al fresco picnics with great views. Pack fruit and sandwiches and gather your crew around the tables while you plot your afternoon activities. You may decide to divide and conquer, splitting off into various directions: pools, beach, fitness center, massage treatments – then reconvene at the Tiki Bar for late-afternoon slushy drinks. Generously-proportioned three- and four-bedroom vacation condos (all with three full baths) sleep 10 - 12 comfortably. You’ll have quite the crew to feed, so those granite countertops in the fully equipped kitchen will definitely get a workout. Rotate breakfast duty so you’re not on the early-bird shift every morning, and declare yourself fully “clocked out” for a night or two at a favorite local eatery. Ask at the front desk for hole-in-the-wall hidden gems or the more mainstream crowd-pleasers. The jetted tub in the master is your personal recovery zone after 18 holes of golf, or paddling against the current in kayaks. Evenings are best savored on your private oversized balcony, looking out over the Atlantic, wine glass in hand. Nearby outdoorsy activities include kayaking, paddleboarding, zip-lining and horseback riding. And when you’re ready to venture beyond the surf and sand, head for Barefoot Landing shops and dining and the adjacent Alligator Adventure, the reptile capital of the world (with plenty of furrier animals too). 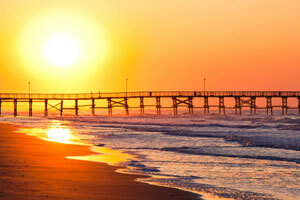 See what you can reel in off Cherry Grove Pier – there’s a bait and tackle shop for gear rental. Or start making your way through the more than 100 area golf courses. - Front desk is open 9:00 AM-5:00 PM daily. The check-in location differs from the property location. To check in, go to 414 Main Street North Myrtle Beach, SC 29582. Guests that are planning to arrive outside normal front desk hours can pick up keys outside the front desk office. For more information please contact the property using information on the booking confirmation. Please note that motorcycles are not allowed at this property.